Perform all the tests the dealerships can such as Diesel Particulate Filter Regenerations, Injector Cut-Out Tests, change engine parameters, SCR system tests, turbo calibrations, and much more. Perform detailed step-by-step repairs for each and every single code. 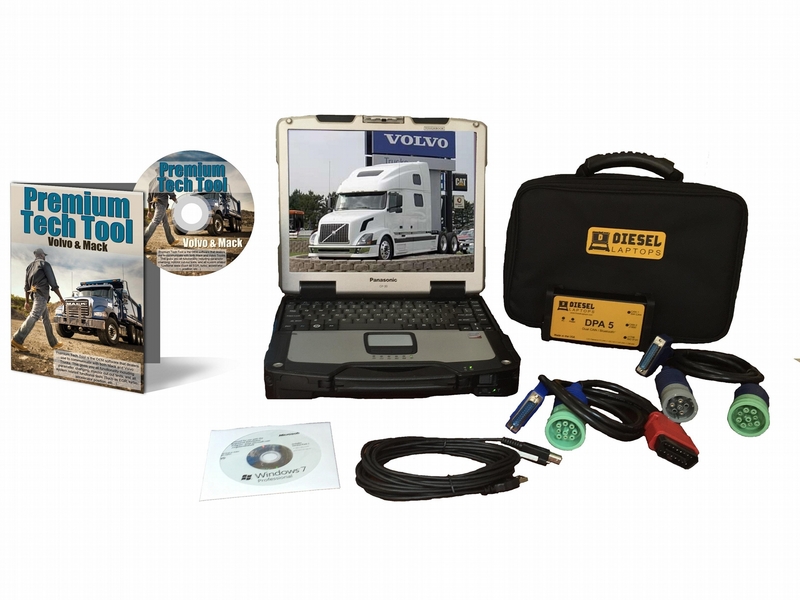 Coverage includes Mack & Volvo trucks, engines, transmissions, and other related ECU's such as suspension, brakes, radio, and many more. Windows 10 Pro with genuine COA. We are an authorized Microsoft Refurbisher, and every laptop we sell is 100% legit! You get a genuine product key and recovery disc as well. Rhino lined top lid. Yes, this already rugged laptop was made even more rugged with a custom Rhino lining on the top lid! This is our private label DPA5 adapter. It has been tested and verified with the Premium Tech Tool software and works perfectly. It is durable (made out of metal), has a 2-year warranty, also comes with DG Diagnostics (free diagnostic software program).